At one time, natural and/or organic products were a niche market. Not so now though, in fact it is one of the biggest growing markets for consumer products as has seen a 200% increase in the last year. Because consumers are becoming increasingly more knowledgeable about skin care and environmental issues, this has shaped their product demands. As much as 28% of all product consumers, choose natural products. So what does this mean for manufacturers (regardless of size)? For some, it is a case of reformulating their products lines to ensure they are free from harmful chemicals. But should more be done? Removing the harmful chemicals certainly contributes to greener skin care but should it go further to include biodegradable, recycled/recyclable packaging, choosing organically produced ingredients, reducing ones carbon footprint. Organic? Natural? What is this? 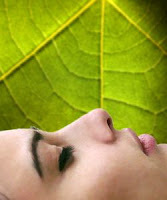 Organic is certainly a current buzzword throughout the beauty industry and one that undoubtedly sells. However, is it confusing? I certainly think so since we all have different perceptions of organic. Many people are actually unaware that for a product to be called organic, 70% of the total ingredients must be organic. That leaves 30% that can be made up of, well… anything. In order for a product to be certified by the Soil Association, it must contain 95% organic ingredients. 'Natural’ is probably even more misleading. For a product to have natural on the label, it only needs to contain (wait for it…..) 1% natural ingredients. What about the other 99% ? There is no doubt about it, when it comes to making organic/natural product choices, one does have to really be on their toes to ensure you are actually getting what you are expecting. A green product manufacturer will go further than this though (as the examples below will show). Many deliberate intensely over the type of packaging they use. For a ‘green’ product to be truly green, it will come in biodegradable, recycled, recyclable packaging or from sustainable forests (in the case of new paper/card materials). Fair Trade and fairly traded goods means that producers/traders in developing countries have been paid a fair price for their goods. Goods that have been fairly traded have not exploited humans, animals or the environment and very often go hand in hand with organically produced goods. More often than not, you will find that the independent manufacturer of natural products, who creates their products by hand, will offer far more than a measly 1%. 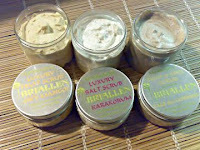 Pictured here is a range of the most gorgeous, sumptuous scrubs, 99% (1% non-paraben preservative) from Briallen. All that natural, skin-loving goodness from only £3.65! Beyond Organic Skincare’s entire range are certified organic by the BDAA. Truly organic AND incredibly affordable! The Travel Pack £21.60 (pictured) is a great introduction to the range and little goes a very long way. Cioccolatina is an excellent example of an independent manufacturer of gorgeous soaps, body butters and balms made with fairly traded/sustainable ingredients and who is actively involved in the cause. 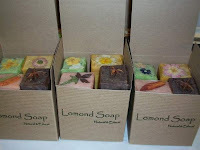 Pictured here is Karite, a creamy soap bar made with over 70% fairly traded shea butter, £3.50. Lovely!! Ruby Red Cosmetics offer the most super duper, hip and trendy, organic, natural, handmade products and have solid ethical principles (see their About Us page – a really great read). Thankfully, they are effectively spreading their ethical words to the mainstream and have featured in magazines such as Marie Claire and Vogue. Please come to my blog to collect it. Wonderful Article. Don't ya just love Lomond. Oh thank you Enchanted, how wonderful! !